Give youth the confidence they need (and you need!) to be alone at home. 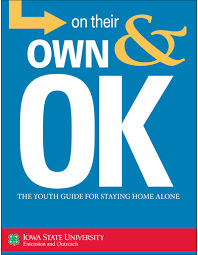 "On Their Own and OK" is covers the basics of safety, easy cooking, sibling baby sitting, and much more! Perfect for 4th through 6th graders. $40 for 4-Her's, $45 for non-members. Morning and afternoon snack and lunch are provided.